Senator Blumenthal speaking at the Darien Democrats rally. The rally, which saw over 250 rally-goers, marked a new chapter in the party's political standing in Darien. 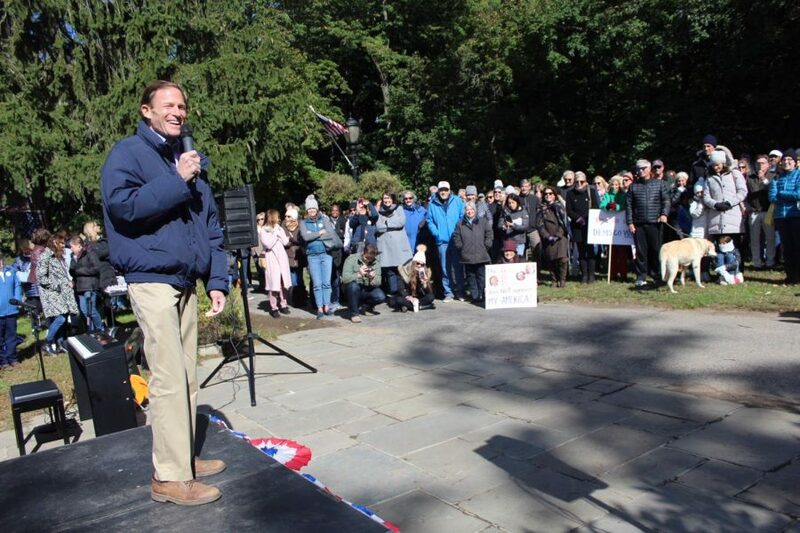 This past Sunday, October 21st, the Darien Democrats held their first-ever rally at Tilley Pond Park in support of upcoming candidates for the mid-elections. The rally started at 1:00 p.m. with the pledge done by senior Katherine Lester followed by a series of speeches. In attendance was Senator Richard Blumenthal, former Representative Jim Himes, Attorney General nominee and current representative William Tong, Representative nominee Matt Blumenthal (son of Senator Blumenthal), Connecticut State Senator Bob Duff, and Governor nominee Ned Lamont. Part of the crowd from the rally, which saw over 250 people in attendance. 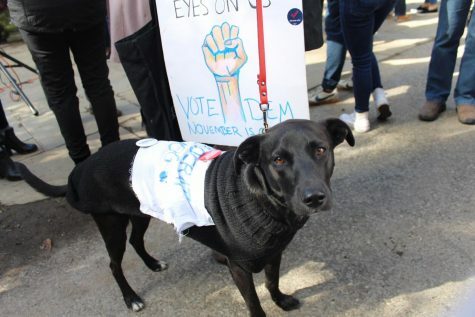 The rally saw around 250 people in attendance, many of whom were members of other organizations such as “Students Demand Action,” “Moms Demand Action” and “203 Action.” Other rallygoers were residents of Darien or had come from all over Fairfield County to support the rally. The rally included speeches by the many politicians and nominees discussing their stances such as why the upcoming November 6th election is so important. Senator Blumenthal started off the series of speeches by discussing his experience with the Brett Kavanaugh hearing, and shared his disgust that such an accused man would still be viable for the Supreme Court. The crowd seem to share in his disgust, booing whenever Kavanaugh’s name was said, and cheered when Senator Blumenthal praised the #MeToo movement and hope for sexual assault victims to feel okay with coming forward in the future. The senator, who has been a long advocate for stricter gun control laws in the aftermath of school shootings like in Sandy Hook and Parkland, share his disdain for governor nominee, Bob Stefanowski. The next speaker was Ned Lamont, who is currently on the campaign trail for his Governor nomination. Darien was one of his stops on his campaign trail, and he commented on how amazing it was that in a Republican-dominated town there can still be so many Democrats willing to support their candidates. Lamont highlighted his measures to ensure rights for the LGBT+ community, especially after the administration’s newest measure to redefine gender as only being male or female in federal programs. Governor nominee Ned Lamont speaking about current issues at the rally. The rally seemed to resonate with Darien residents, regardless of political party. 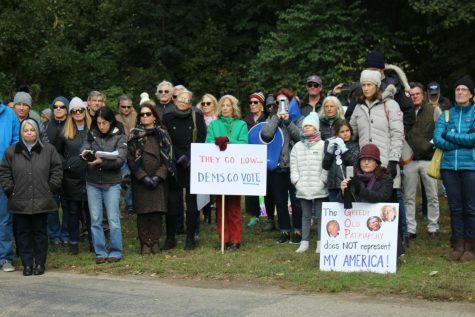 Many stopped to look when they drove past the park in their cars, and those passing through the rally on a daily stroll were shocked to believe the amount of Democrats that were in Darien. Because so many unaffiliates are deciding who can run on the final ballot, the polarization in the positions held by candidates and parties will continue to increase in an already extremely polarized political era. A few Darien residents with rally signs. 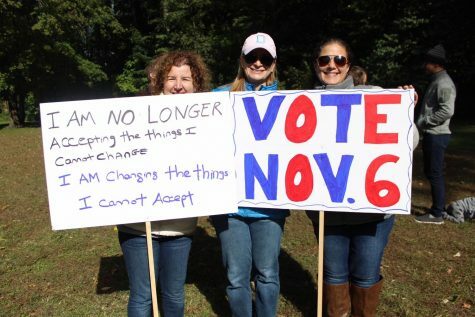 The upcoming November 6th election is already having added importance due to the March for Our Lives movement, which rose from the aftermath of the Parkland Shooting. 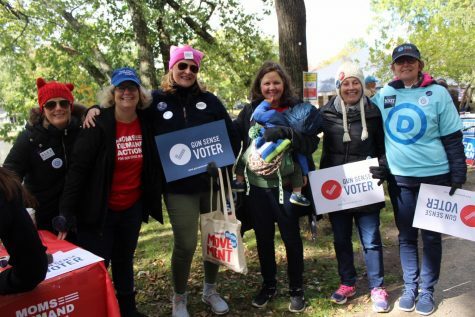 The movement, which led walkouts on March 14th and April 20th, helped raise awareness about gun violence and the importance of voting for people of all ages. The issue has, of course, special prominence in Connecticut after the Sandy Shooting that happened in 2012, making Connecticut one of the leading states when it comes to gun control. 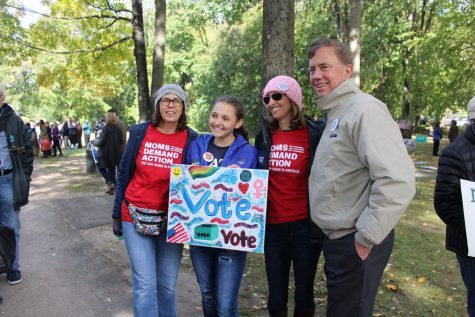 In a recent ad campaign by Ned Lamont, he used slain Dawn Lafferty Hochsprung, the former principal of Sandy Hook who lost her life trying to save some of the children, and her daughter, Erica Lafferty-Garbatini, against Lamont’s opponent, Bob Stefanowski. The ad caused quite some controversy, with the older brother of Jesse Lewis (one of the kids whose life was lost in the shooting) commenting on how vile it was to use such an event for a political gain. The increased aggressiveness towards the final weeks of election day is unsurprising though. Public opinion polls conducted by Quinnipiac University released in late August showed that for awhile the race between Bob Stefanowski and Ned Lamont was close, almost neck and neck, while recent ones place Lamont slightly ahead. 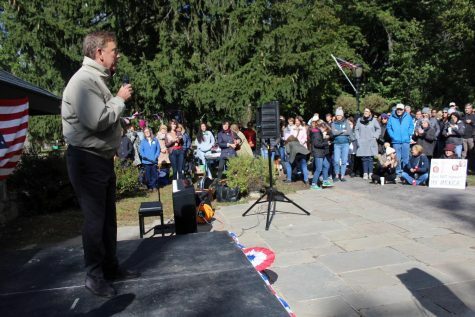 By conducting rallies such as the one by the Darien Democrats, they are ensuring that they can reach out to as many voters as possible before time is up. 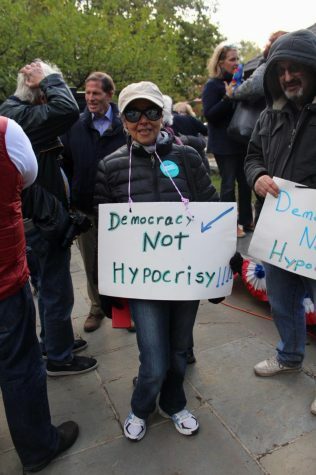 A lady with a “Democracy Not Hypocrisy” sign at the rally. The rally disperses by 3:00, and many of the rallygoers walk away shivering, yet smiling. Senator Blumenthal stays behind to answer questions that a few rallygoers have, and they, in return, thank him for all the work he has done. The rally’s group of high-school age volunteers start to put the banners away, hands almost too froze to be able to grasp anything. A stream of rallygoers sign off on remaining letters that will be sent to voters in North Dakota to show support and solidarity with them in trying to elect Heidi Keitkamp once again to the Senate. Many political scientists are saying that the upcoming election may show a “blue wave” nationwide (and no, sadly not our high school’s blue wave). While the Darien Democrats may not be able to turn Darien completely blue, their rally is perhaps an example of the rise of this new wave. A group of “Moms Demand Action” at the rally.